The Best (Small) Bathroom Ideas Ever! Bathroom design inspiration you never knew you needed. On the long list of struggles of living with a small bathroom, finding ample and viable storage space would definitely be at the top. City-dwellers, you know all too well what we’re talking about. A step further from that, the decorative scheme of said small bathroom—just because you’re working within a constricted space, doesn’t mean that you should be compromising on the design. Luckily, we’re here to help with a whole slew of clever tips and tricks for decorating a bathroom, regardless of how small it actually is. What happens when your bathroom and kitchen are located in the same room? A little creativity is surely in order. This clever NYC-dweller opted for a tub in lieu of a standing shower and created a mini platform to visually separate the two spaces. We’re here with proof that storage can, in fact, be beautiful. Invest in a solid shelving unit that can contribute to the decorative aesthetic of your space and utilize it to neatly display all your essentials. Bonus points for adding a touch of green for good measure. While most may feel inclined to shy away from a darker palette in a compact space, there are a handful of ways to get around said decorative rule. Filling your space with a vibrant splash of art is certainly one way to do it. Sure, it may be a rather untraditional, but there’s no denying the fact that this mini gallery wall makes the room. A bulky cabinet can crowd an already-small bathroom, so opt for a floating shelf instead. Mount it over other bathroom fixtures to make the most of the space you do have without sacrificing your countertops (you’ve got to store those must-have skincare items somewhere, right?). Aside from the bold statement of the contrasting black and white motif, we love the sneaky storage space built into the wall. It takes up less room than a protruding shelf and is just as effective. 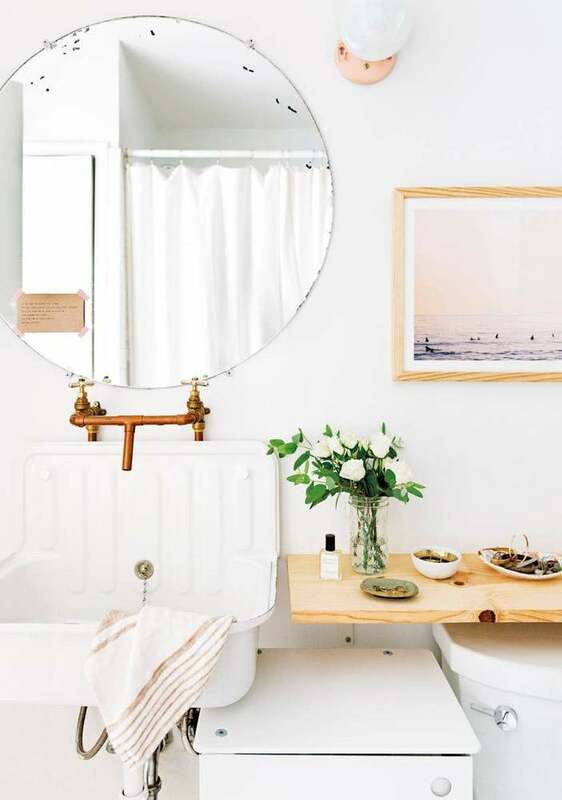 A totally whitewashed bathroom will instantly room look bigger”] As an added bonus, whatever non-white pieces you do decide to incorporate —like this gold faucet or hanging mirror— will stand out better. A fearless palette with an equally bold design features an oh-so-chic sink for two—because, when you don’t have the room for a his-and-hers sink, this one definitely doubles as the next best thing. For when you can’t quite make up your mind on a bath tile, why not just got with them all? Keep the sink surround clean, save for a handful of essentials. Bonus points for wall hangings with space for storage! Gather toiletries in a sleek vanity tray or dish to keep the sink surround free of clutter. A vibrantly colorful vanity unites the eclectic slew of patterns and finishes within this compact space, all the while providing the bath with a decoratively-bold storage solution. The bathroom is certainly not exempt from a gallery wall display, especially when working with a color block as bold as this. Don’t be afraid to saturate the small space with color—just because it’s a tiny bathroom, doesn’t mean it has to be a sad, colorless one. This story was originally published on February 2016, it has been updated.